‘Let us read, let us dance, let us play – three amusements that will never do any harm to the world’. Voltaire. Lazy Day Sunday was anything but. For a lot of us – over 80 in fact! – this particular version of Lazy Day Sunday meant getting up at 7am for Doc’s Run and the Masters golf. Seventy eight participated in Doc’s Run, and everyone finished! There were seven golfers, and they, too, completed their respective rounds of golf. We were blessed with the presence of the Doc himself for the run this morning. This is something that we have been doing for a very long time now – well over thirty years – and it was Dr Kenny Miller who started it all off. And he’s still doing it, albeit a little slower nowadays. Isn’t that the beauty of aging: it allows us to slow down and perhaps appreciate a life a little better. And it was a camper one, two, three today. I don’t remember that ever happening before. Campers are now running faster then the counsellors!! Amazing! After the presentation of Doc’s Run shirts in Wasserman Hall, Jason was then able to present the ‘year’ awards – hats, shirts, backpacks – and the now famous four year handshake. We do like to acknowledge longevity and loyalty here. We love it that so many people like to come back here year after year, and certainly for as long as they can before the real world gets in the way. 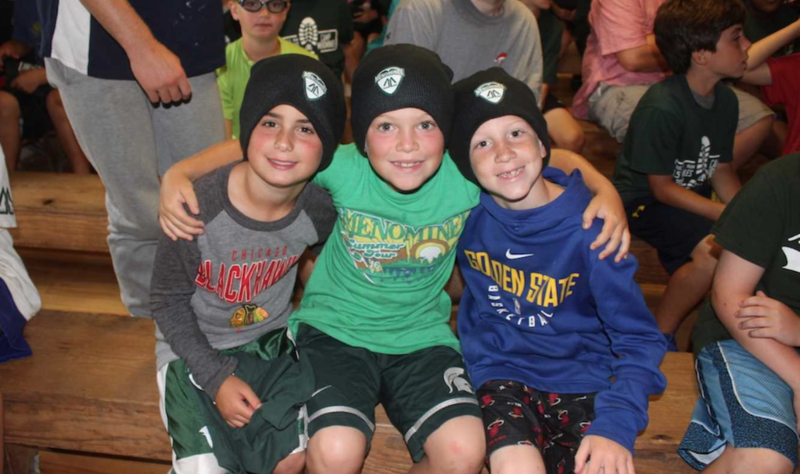 Talking of which….we entered the real world this afternoon as we took the boys to Minocqua. We left around 1pm and that gave us a good 4+ hours of shopping and eating before we headed for the ski show. This is something we have been doing for years, and the guys still get excited about it. We thought the show might get wiped out by the threatening weather, but it just kept south and west of us, so that we barely noticed the heavy rain that fell elsewhere. As I write this, the boys are playing Midnight Manhunt. We use that term for alliterative purposes only, as it is neither midnight, nor are any men being hunted. It’s another game of squirt guns and running with flashlights, and the boys love it. It certainly wears them out before bedtime. And we will all be ready for bed when it comes. As our last weekend of the summer comes to a close, please know that all is well, so you, and we, can safely rest.